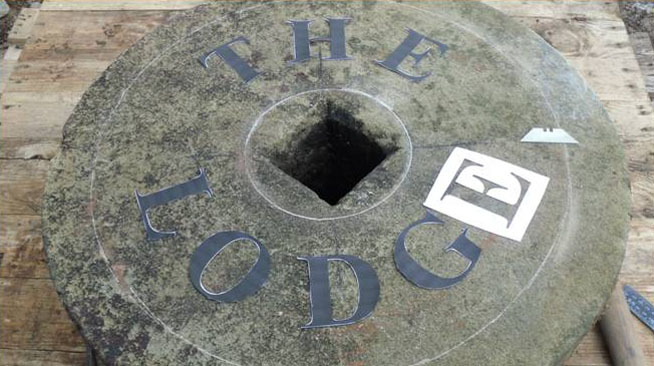 The Lodge ~ Keynedon Barton, Sherford, South Devon. 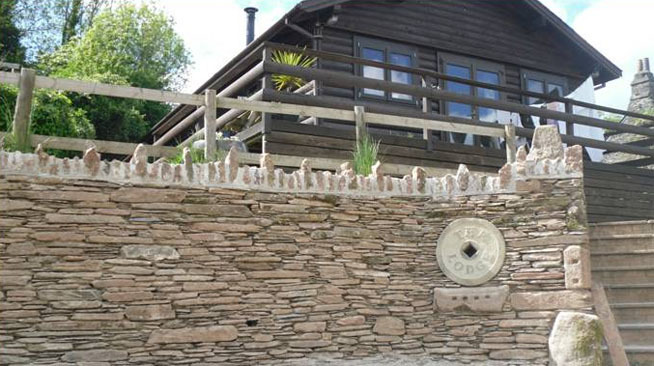 Although a fairly modern structure, The Lodge is a log cabin style property situated amongst a group of Grade II listed buildings which form the manor complex at Keynedon Barton in Sherford, South Devon. 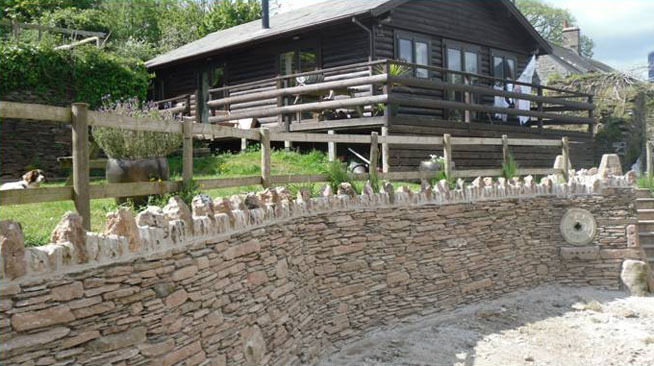 When this log cabin was first erected a concrete block retaining wall was constructed in front of it but it was never completely finished as it needed to be faced with stone and we were asked to carry out the work.The stone we used came from an existing stockpile of old stone, mainly slate, that had been here for many years and originally came from a variety of walls and structures from around this very old manor complex which can trace its history as far back as the 13th century and earlier. 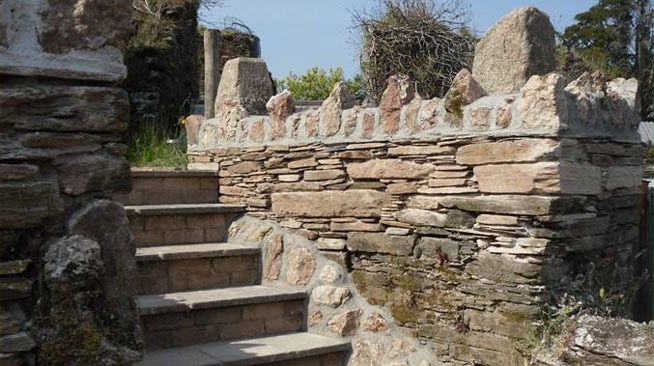 The new wall was set out on a curve and was also battered, which means it is not built upright but on an angle, and in this case this was about seventy-five degrees. 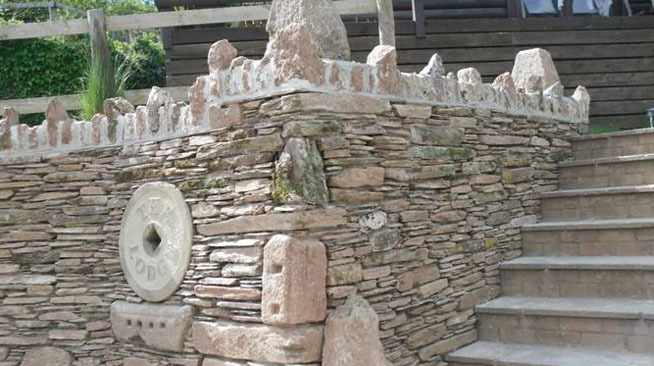 It is also constructed using the ‘Dry-Stack’ method which involves using mortar but keeping it well back from the face of the stonework to give it the appearance of a dry stone wall. 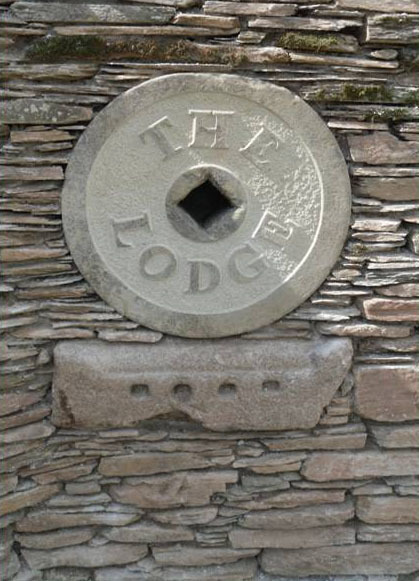 An old grinding wheel comprising of ‘York sandstone’ had been lying in the nearby stream for more than sixty years, it was retrieved and decided that this would have the name ‘The Lodge’ carved into it and then set into the stonework of the new retaining wall. 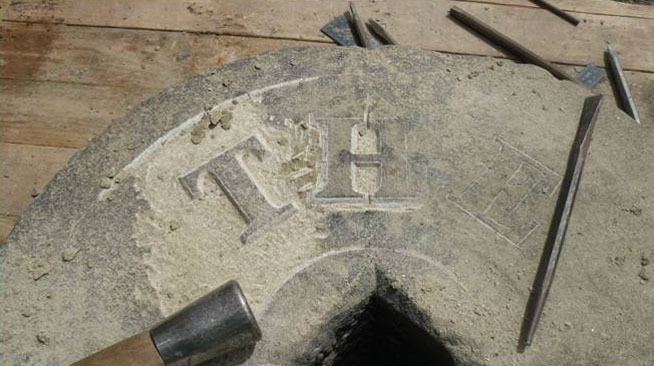 A font was agreed on and templates made for each letter, this was transfered onto the stone wheel and then the letters were cut, or rather the background reduced as the letters were carved in ‘Bas Relief ’ style. 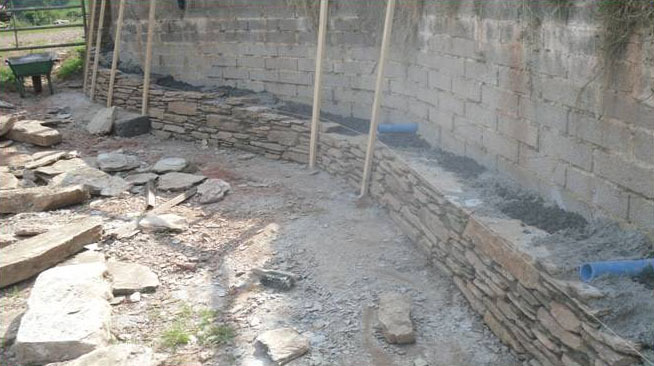 Once finished it was set into the new retaining wall. 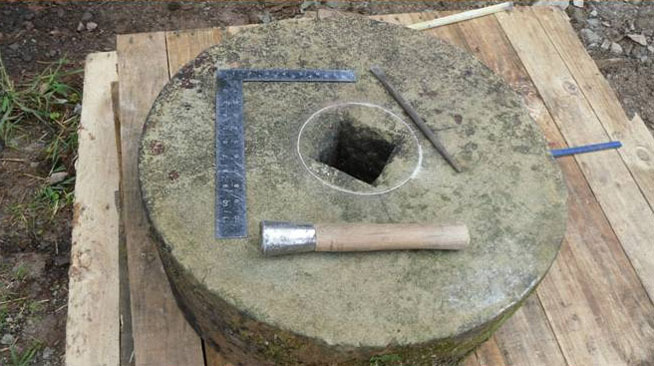 The piece of stone which this grinding wheel sits on is actually an old window sill that once had iron bars set into it and most likely came from one of the buildings on this very old manor complex. 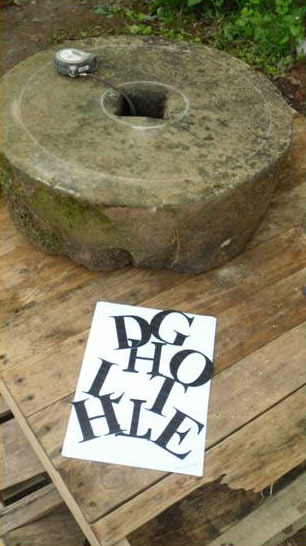 It is granite and probably dates back to the Tudor times. 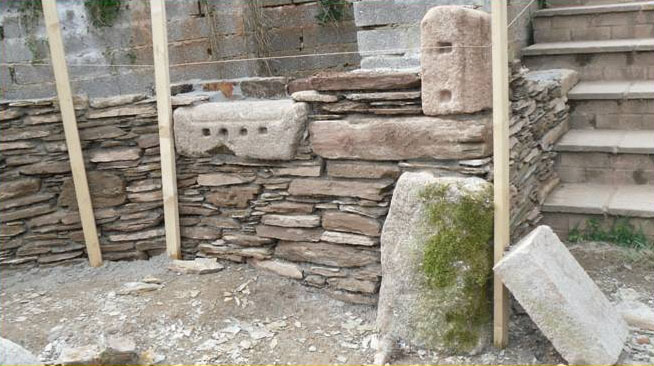 Other bits of feature stone were used as quoins and incorporated into the corner of the new wall. 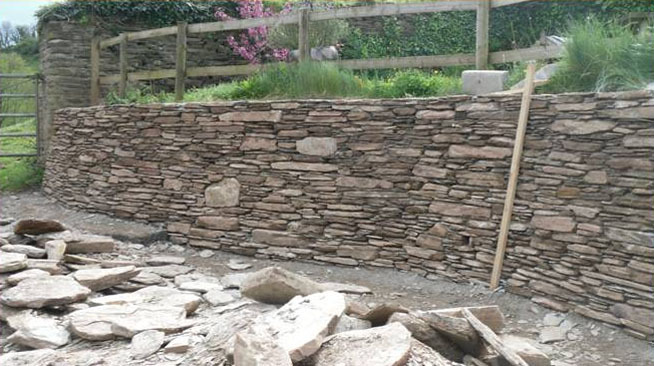 Finally we constructed a coping for the top of the new wall using a stone which the local farmers call ‘Woodacre’ and this is a ‘Schist’ type rock usually found when ploughing the fields. 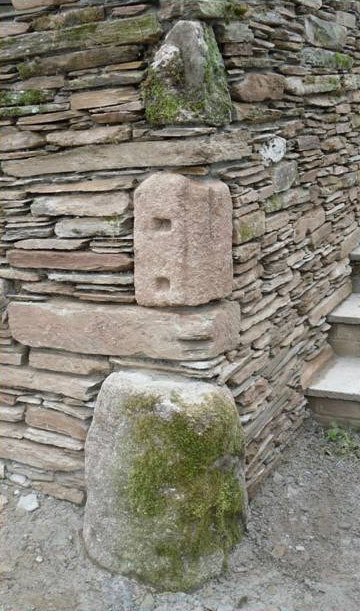 Old granite ‘Post stones’ were set into the top of walls as you go up the steps to the Lodge, these originally had upright timbers sat on top of them which carried timber lintels and ultimately the weight of the roof to a nearby barn. 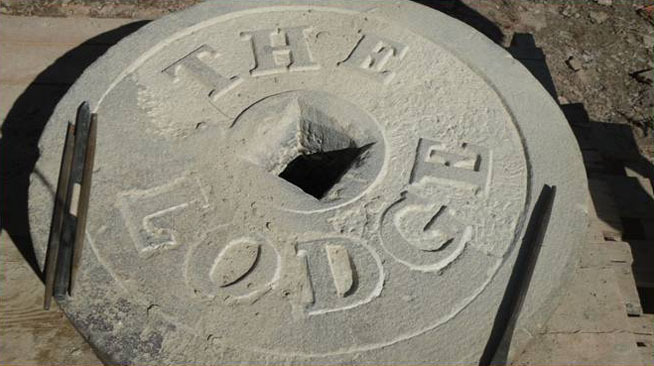 They are sometimes known as ‘Joggle stones’ and these date from the sometime during the 18th or 19th centuries. 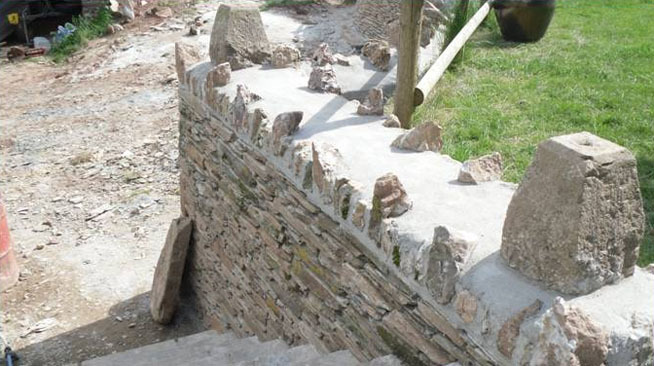 We also carried out other walling within the grounds of Keynedon Barton after a stream burst its banks and caused sections of walling to collapse along a causeway. 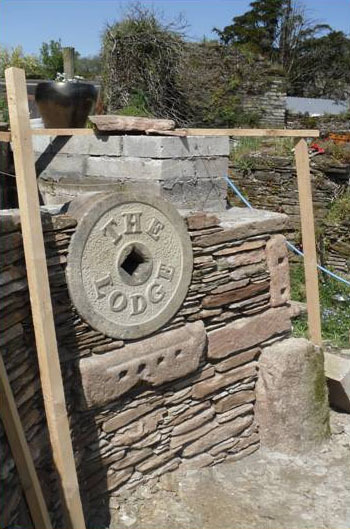 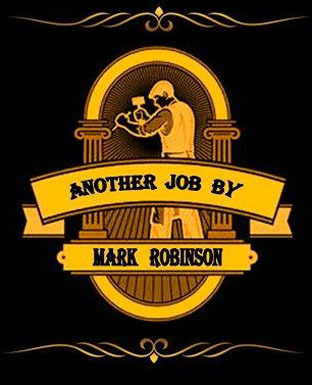 You can see this project if you click here, and this also tells you a little more history about the place. 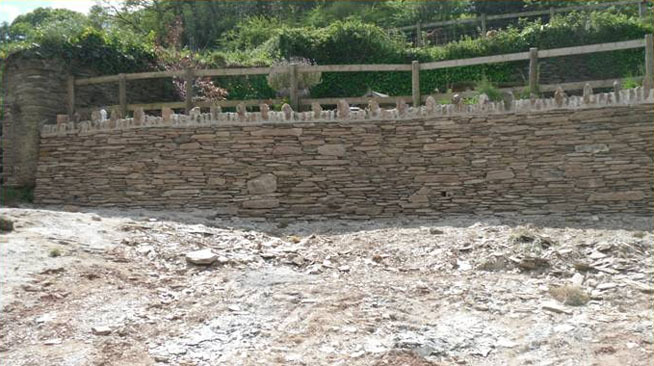 Another small job involved rebuilding a section of wall on the ‘Root House‘.